The S&P 500 has been on a downward trajectory since mid-May and the index is now probing the lows reached in March. However, sentiment readings are much too sanguine indicating that further lows are ahead for US equities in the near term. First of all, while AAII sentiment is bearish, it is not at the bearish extremes seen last March. Large speculators’ net positioning in the NASDAQ 100 futures and options has been a good contrarian indicator. As the chart below shows, the latest CFTC Commitment of Traders data shows that not only have NASDAQ 100 large speculators not thrown in the towel on this market, they are buying this dip. Although downside risks to growth remain, they appear to have diminished somewhat, and the upside risks to inflation and inflation expectations have increased. The Committee will continue to monitor economic and financial developments and will act as needed to promote sustainable economic growth and price stability. In other words, the Fed opted to do nothing and go into jawboning mode on inflation. The trouble is, as this Bank Credit Analyst article points out, commodity inflation is likely to continue until emerging market central banks start to get tough on inflation. Many of the emerging market central banks are already hesitating in their inflation fight (see this) and they take their cue from the Federal Reserve. If an emerging market central bank becomes overly aggressive on inflation then it runs the risk of strengthening their currency and eroding their own export competitiveness. 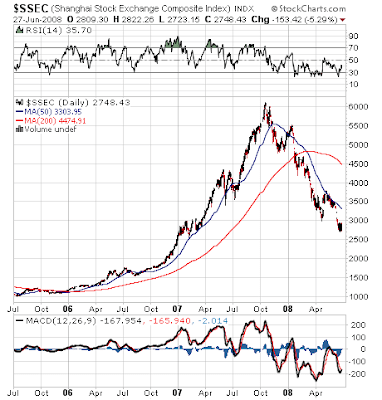 Conclusion: Stay long the commodity inflation trade, but watch the Baltic Dry Index for signs of widespread weakness in the global economy. Recently there have been two discussions of a possible market crash. The first warning comes from the Bob Janjuah, the credit strategist at RBS. The second is a more nuanced discussion coming from Todd Harrison, who writes at Minyanville. The chance of a Market Crash is unlikely. Understand that Market Crashes are tail (low probability) events. Even if we accept that stock returns are not normally distributed but have fat tails, even fat-tailed events are still relatively low probability events. Market Crashes occur because of the Wily Coyote effect. (Remember when he runs off the cliff in the Roadrunner cartoon, looks down and realizes that there is nothing beneath him?) In order for that to occur, investor sentiment needs to be fairly sanguine. Given that we have had two discussions of a possible Market Crash within the space of a week and the most recent AAII sentiment survey readings are now in the bearish territory (contrarian bullish), it seems unlikely that Wily Coyote has stepped off that cliff. All this doesn’t mean that the equity market can’t fall – it’s just unlikely to crash. I have been looking for a panic sell-off to mark an intermediate term bottom (see my recent post). Mark Hulbert reports that current sentiment readings, while bearish, isn't bearish enough for a capitulation bottom. This suggests a scenario where the market breaches its March lows and continues to decline. It all seemed so easy. If you had a decent record, all you had to hang out your shingle and start a hedge fund; charge 2% and 20%; and get enormously wealthy. Many did. I have written in the past that the hedge fund industry didn’t make sense to me. Returns seemed too correlated to equities and they didn’t offer value given their fee structure. Then the shakeout began. Hedge funds blew up or started to close left and right (see this). There is a recent WSJ article about the continuing shakeout in the hedge fund industry. Key quote from one commentator: “We used to invest in hedge funds because we got stocklike returns with bondlike volatility. Now we're getting bondlike returns with stocklike volatility." The problem was expectations were too high, hedge funds got over-sold and the field got too crowded. Here is a study of well-known managers (John Neff at Windsor Fund, Warren Buffett at Berkshire Hathaway, George Soros and Jimmy Rogers at Quantum, Julian Robertson at Tiger, Ford Foundation) showing the Sharpe ratio of these top investors were no better than 1.0. In retrospect, some of those hedge fund marketing claims of high returns with Sharpe ratios of 2.0 or more seem overblown. Overall, the $1.9 trillion hedge-fund industry is holding up. The average fund is flat this year, through May, according to Hedge Fund Research. That beats the decline of 3.80% in the Standard & Poor's 500 in that period, though it's below the gain of 0.94% in the Lehman Brothers bond index. Last year, the average hedge fund gained 10%, compared with returns of 5.5% for the S&P 500 and 7.8% for the Lehman index. An institution invests in alternative vehicles because they offer attractive risk-return characteristics, usually returns that are similar to their other asset classes but at a lower level of correlation. Today we have an industry delivering returns that are highly correlated to equities, but their justification for keeping their jobs is that they outperformed the S&P500??? If that the case, how about institutional equity-like fees (say 50 basis points)? As I write this, the 10 year yield is about 4.2% and the S&P 500 is trading at 21.8 times reported earnings and 14.6 times forward earnings. In recessions, analysts cannot forecast forward earnings well so we’ll throw out the forward P/E. Using reported earnings and plugging the results into the Fed model, which has well documented problems, the market is slightly undervalued. One of my other favorite rules of thumb in looking for a bottom is the valuation of the investment banks. The investment banks tend to bottom out at a price to book ratio of 1 during periods of economic stress. The major investment banks such as Morgan Stanley (MS) and Merrill Lynch (MER) are now trading at 1.3-1.4 times book, down from about 1.5-1.8 in late April. Lehman Brothers (LEH), which has had well publicized troubles, now trades at a discount to book value, as are some other brokers such as E-Trade (ETFC). The trouble is, of course, we don’t quite know how good the book value figure really is as there may be further write-offs coming down the road. Despite these mixed signals, the market may not get screamingly cheap as we are likely in a period where the market moves sideways (see previous comment). Based on these considerations, I would rate the valuation metric as being neutral to mildly bullish. I like to keep an eye on the problem areas of the economy in order to time the turn in the market. The troubled industries in this recession are financials and real estate. Employment is another area that inevitably falls off in economic slowdowns. The financials and investment banks may be near levels where they stabilize but these stocks and the other problem groups are still underperforming with no end in sight. The chart below shows the relative returns of the S&P 500 Capital Markets Index, which is comprised mainly of investment banks, against the S&P 500. The group has been in free fall against the S&P 500 but it is approaching a region that technical support has shown up in the past. Similarly, the S&P 500 Financials has also been in a relative free fall against the S&P 500 but is nearing a relative support zone. Other problem areas of the market aren’t so lucky. The chart below shows the S&P 500 Homebuilders relative to the S&P 500. The group is still falling and is has not yet declined to a relative technical support zone. A similar picture holds for the relative chart of the S&P Supercomposite Human Resources and Employment Index (temp and employment agencies). Any improvement in employment should show up quickly in these stocks. The first step to recovery is recognition that there is a problem. 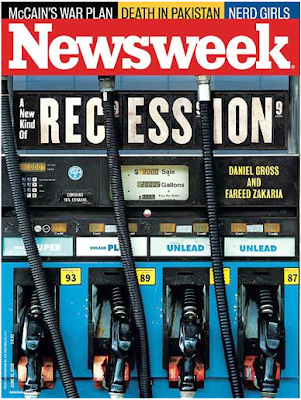 This June 16, 2008 headline from Newsweek and front page story is an indication that the recession story is now in the public consciousness. There was a similar “Waking up to the Recession” cover in BusinessWeek on March 24, 2008. In the past, an excellent time to buy equities has been when the public recognizes that the economy is in a recession as most of the gloom and doom is already embedded in investor psychology. Another economic signal I look for is an upward sloping yield curve. The current yield curve is indeed upward sloping, indicating that the central bank is in easing mode – a bullish sign for equities. Given the current market backdrop, the S&P 500 is likely to decline and test the March low in the next few weeks. Would such a re-test be successful? For that I turn to the technicians. Most technical analysts identify intermediate term bottoms with two components: an emotional panic capitulation sell-off followed by confirmation that the bottom is in place in the ensuing rally. A classic panic capitulation bottom would be a high volume day with the market trading down for most of the day and then closing near the highs of the day. The flamboyant technician Joe Granville, who correctly issued an all-out buy on the market in February 2003, has been quoted as focusing on parabolics to gauge these extreme moves. After a capitulation bottom, technicians typically want to see some form of strength on the follow through. This Investors Business Daily article, written about two weeks after 9/11, is a good sample of what to look for at market bottoms. When I see the panic bottom, the rally follow-through and the a majority of the other valuation, economic and psychology indicators flashing bullish, I plan to plunge ahead and buy the low-priced Phoenix stocks (with the appropriate stops of course) and hang on for the ride. They may earn only about £2,000 a year but they are 400 million-strong, scattered across the globe and have just bought themselves a fridge. Meet Generation A, who soon could become the most important economic force on Earth. All those consumers will need more stuff, which will create enormous demands on commodities. This means that not only consumer non-durables (e.g. soap) will be areas of growth, but non-durables (furniture, cars) as well as services (telecom) in the emerging market countries. Jeremy Grantham of GMO also comments on this in his essay The Emerging Emerging Bubble (see page 9). Key risk: Continued growth in the emerging markets depend continued open markets. If the developed trading blocs (US, EU) start to close their markets to the emerging market economies, then investors would have to re-assess the longevity of growth story in the emerging markets. Put it another way, there is a joke in our household that Santa Claus comes from China as everything he brings is stamped with “Made in China”. Look at your shirts, your toys and your electronics. If they continue to be made in China, India, Turkey, Vietnam, Guatemala, etc. then the emerging markets should continue their long-term growth, which will also be bullish for commodities. Both Bill Miller’s Legg Mason Value Trust (LMVTX) and Ken Heebner’s CGM Focus Fund (CGMFX) have great long-term track record that would be the envy of most equity fund managers. While Miller has underperformed recently, he is still sticking to his guns in his latest commentary and he continues to focus on long-term value and a low-turnover philosophy. By contrast, Heebner has the hot hand right now (see Fortune article here) and runs a high-turnover portfolio. Using the techniques shown in the sidebar titled Reverse engineering a manager's macro exposures, I estimated both Miller and Heebner’s sector and other exposures. I pointed out before that Bill Miller started to tilt towards Value in a significant way back in December 2007 and his bias is unchanged. As shown by the chart below, Bill Miller’s portfolio remains tilted towards Value, while Heebner is tilted towards Growth. Much of their style differences are attributable to sector weightings as the Russell 1000 Value Index is significantly overweight Financials compared to the Russell 1000 Growth. Bill Miller main overweight is in the beaten down financial sector of the market, while Heebner is underweight the sector. When considering these two managers one might be tempted to conclude that they are polar opposites of each other, they do agree on some points. Both managers’ portfolios have above average market betas, indicating that they expect the market to rise. Moreover, they are both underweight the traditional defensive sectors of the market such as Health Care and Consumer Staples. Not to put words into each manager’s mouth, it seems that Bill Miller believes that despite the financial stresses evident in the system, the large financial franchises remain intact and have real lasting value. Miller’s investment thesis depends on no other hidden landmines blowing up in the financial sector. By contrast, Ken Heebner believes that the commodity cycle is not over and is betting big on their continued rise. His thesis depends on continued US Dollar weakness and, to a lesser extent, that a US slowdown will not significantly drag down world growth. So far, he has been right, as evidenced by the new recovery high seen in the Baltic Dry Index. However, Heebner’s portfolio is a high-turnover portfolio and Heebner has shown himself to be flexible to reverse himself should the situation change. The views of both of these investors deserve our respect.